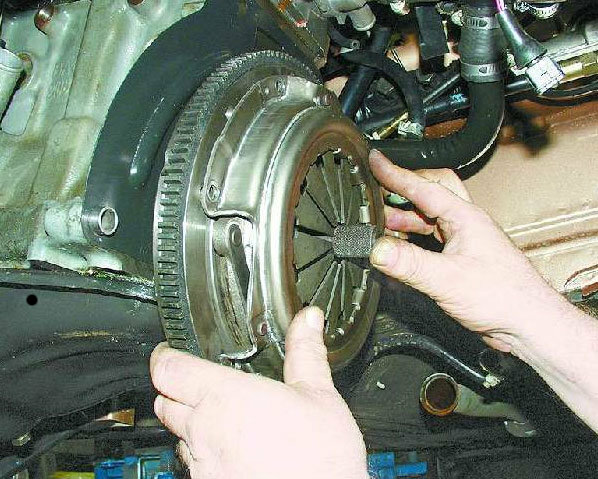 How to change the clutch in "oke"
The clutch mechanism is designed to transmit the engine torque transmission. In essence the clutch is a mediator between motor and mechanical gearbox. In cases of equipment of cars with automatic transmission – the clutch they have, as such, is absent. - the transaxle input shaft (used). Women prefer cars with "automatic" and most men prefer a machine with a reliable "mechanics", following the principle: "the simpler - the more reliable". Is the clutch mechanism of the two disks: master (called the "clutch basket") and slave - with friction pads, which eventually wear out, especially while driving in extreme road conditions. That sometimes requires a complete clutch replacement. To change the clutch can be directly on the machine after removing the box changes gear, but much easier on a rented motor, for example, during the current or capital repair of the engine. To replace both clutch discs, head 8 mm Unscrew the M6 bolts are designed for attaching the drive plate to the engine flywheel. At this stage, before you begin to dismantle the "clutch", the mounting bolts should be applied two or three blows with a hammer through a spacer of non-ferrous metal. That will protect against cross-threading in the holes of the flywheel. Further, consistently, no more than one turn at a time, gradually turned all six bolts. Then both the old clutch removed, and instead installed a new one. Inserting roller transmission through a splined clutch driven plate in the flywheel bearings, a full tightening of the drive plate, after which the roller is removed therefrom. The procedure for replacing the clutch is complete.